When only the lymph nodes in my neck and behind my ears would hurt and swell I would get an outbreak of ulcers, or canker sores in my mouth. But if the ones in my stomach did it, my stomach ulcer would flare up. A few months ago when I touched my lymph nodes I could feel my heart from there. Plus my heart goes faster sometimes. My doctor gave me a monitoring machine so I have to wear this for 2 weeks, then they will take it away to see what is wrong. So I am just wondering why my lymph nodes pulse like this, it kind of worries me because my brother-in-law died from lymph nodes cancer. I have pretty much quit smoking, kind of hard when you have smoked all your life. I am 53. 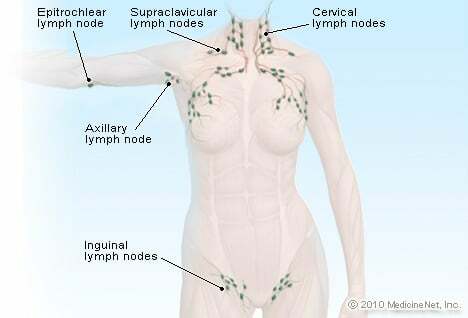 My right lymph node in my neck is 1 cm in size. I had a CT and they are not ruling out cancer. I don't go back in till September 17 to see the ear, nose, and throat specialist. Now I have swollen taste buds and a sore throat. I have virus all the time. My lymph nodes stay sore and burning, and it hurts in my groin area. I had 5 CTs and 1 MRI within 3 1/2 years. The doctors say I have 3 lymph nodes that are at 9 mm size (have not changed during this time frame). Surgeon said they are too deep to biopsy but he will continue to watch. I have a problem after urinating and I can hardly sleep because I'm in so much pain when I lie down. I have night sweat also with swollen lymph nodes.